ixpoker is all about poker, for beginners and amateurs all the way to experts and legends. Either it's a poker room you are after, freerolls, bonuses, promotions or you plain and simple wants to get better at poker this is the place to be. Texas hold'em is without doubt the poker game most players want to join for action, but we also focus on omaha and seven card stud. 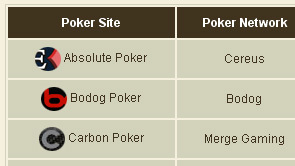 Ixpoker was created to provide easy to access poker information and variety. You will also have access to monthly poker freerolls at ixgames poker forum and the ixpoker community will be based at that forum as well. The freerolls are focused at bodog poker, full tilt poker and doyles poker room. We will advance to other popular poker rooms and sponsor freerolls there in the near future. So many poker news and announcement is on it's way. The complete list of poker rooms and intellectual content can be found at this page online poker reviews. Every friday you can join titan poker's weekly $150,000 guaranteed tournament with buyin $75+$7,50. Titan poker also run SNG's which have been tested very popular among their players. Full tilt poker hosts a $750,000 guaranteed tournament every sunday with buyin $200+$16. If that's not appealing they have around the clock buyin tournament in various prizepools. Cd poker have their big weekly tourney on sunday's with a buyin of $200+$15 you can get access to the $250,000 guaranteed tournament. Every saturday $150,000 guaranteed with a buy-in of $500+$30, every player starts with 5,000 in chips. Party poker upgraded with a new sleek design and software features. Along with all the upgrades you can now receive a new super signup bonus 100% up to $500 which have never been offe by party poker in the past. Join sponso poker freerolls by visiting ixgames and ixpoker's community and poker freerolls forum for passwords to all the fancy poker rooms online. Show the poker competition how good you are at poker freerolls. The Poker Bible - Know yourself and everybody else inside the bible of poker. Poker crusher is the poker software that tells you everything you need to know about every player you meet at any cash game, freeroll or tournament. Whether they are loose-aggressive, loose-passive, passive-aggressive or even aggressive-aggressive you will know what you are against and will improve your own poker game online and offline. Read all you want, experiment and test your skills with ixpoker's poker articles. Everything you wanted to know as a beginner, amateur or expert poker player.